Part 1 Management of waste composites: An introduction to composites recycling; Legislation for recycling waste composites; Waste management. Part 2 Thermal technologies for recycling waste composites: Thermal methods for recycling waste composites; Pyrolysis for recycling waste composites; Catalytic processing of waste polymer composites; Advanced thermal treatment of composite wastes for energy recovery; Fluidized bed pyrolysis of waste polymer composites for oil and gas recovery. Part 3 Mechanical technologies for recycling waste composites: Mechanical methods for recycling waste composites; Additives to upgrade mechanically recycled plastic composites; Improving the mechanical recycling and reuse of mixed plastics and polymer composites; Quality and durability of recycled composite materials. Part 4 Improving sustainable manufacture of composites: Clean and environmentally-friendly wet-filament winding; Process monitoring and damage detection using optical fibre sensors; New developments in producing more functional and sustainable composites. Part 5 Case studies: Designing composite wind turbine blades for disposal, recycling or reuse; In-process composite recycling in the aerospace industry; Disposal of composite boats and other marine composites; Sustainable fibre-reinforced polymer composites in construction; Recycling of concrete. This authoritative reference work provides a comprehensive review of the management, recycling and reuse of waste composites. These are issues which are of increasing importance due to the growing use of composites in many industries, increasingly strict legislation and concerns about disposal of composites by landfill or incineration. Part one discusses the management of waste composites and includes an introduction to composites recycling and a chapter on EU legislation for recycling waste composites. Part two reviews thermal technologies for recycling waste composites with chapters on pyrolysis, catalytic transformation, thermal treatments for energy recovery and fluidized bed pyrolysis. Part three covers mechanical methods of recycling waste composites. This section includes chapters on additives for recycled plastic composites, improving mechanical recycling and the quality and durability of mechanically recycled composites. Parts four discusses improving sustainable manufacture of composites, with chapters on environmentally-friendly filament winding of FRP composites, process monitoring and new developments in producing more functional and sustainable composites. Part five gives a review of case studies including end-of-life wind turbine blades, aerospace composites, marine composites, composites in construction and the recycling of concrete. 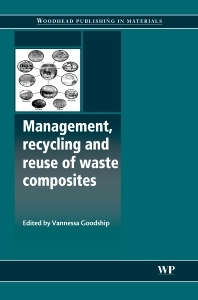 With its distinguished editor and international team of contributors, Management, recycling and reuse of waste composites is a standard reference for anyone involved in the disposal or recycling of waste composites.